It has been a crazy, busy week with so much happening, and so many life changing events occurring, that it has not even really hit me yet. I have so many things that I want to write about that I don’t even know where to begin. I think I will just start with Shanghai … and my Miss Shanghai. 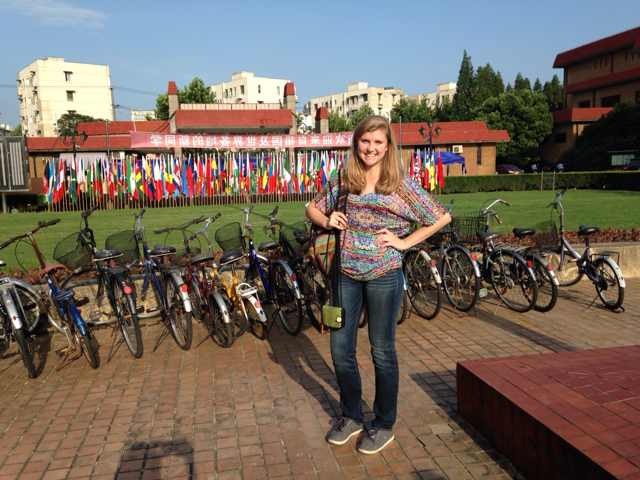 My daughter arrived in Shanghai, China last week and, after a few days of orientation to her study abroad program, she started school on Monday. I hate giving up the tradition of “The First Day of School” photos and, even though she is starting her Junior year in college, I always ask her to send me one. She is always so willing to send me a photo and it makes me smile that she will appease her sentimental mom. These are her first day of school photos – one alone and one with her roommate. 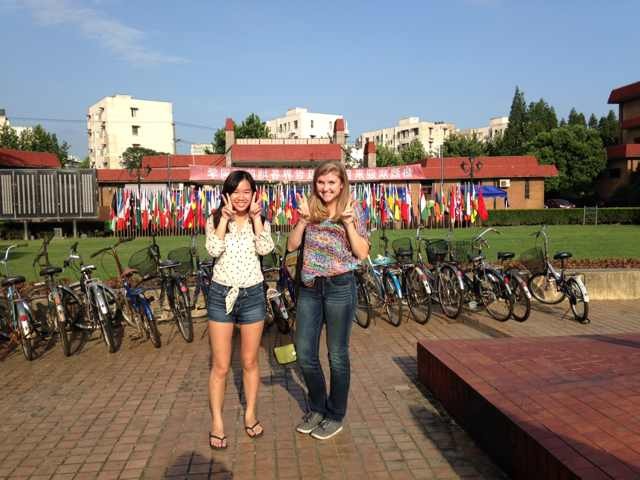 Her study abroad program is located at The Shanghai University of Finance and Economics (上海财经大学) and these photos are just right outside of the campus. My daughter is truly an amazingly adventurous and brave person. 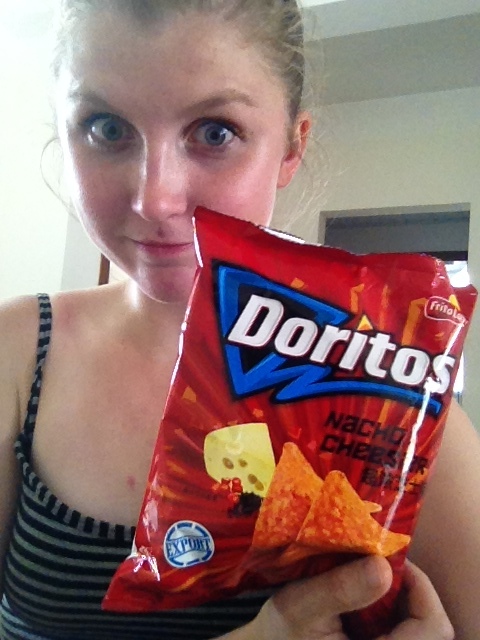 Other than Singapore, our family has not ventured much into Asia yet, so she is forging the culture shock on her own. I think food has been the most challenging experience for her thus far. She has let me know that American Chinese food is NOTHING like the Chinese food that is actually in China. So, if you think you like Chinese food … don’t be fooled. 🙂 She is trying lots of new things, but trying to find familiar food as well. She said that flying into the city of Shanghai felt like it could be any large, modern world city. She, however, lives outside of the city and she has found it to be very different. She told me that I need to watch [the new] “Karate Kid” movie again because that reminds her of where she is living. I plan to re-watch the movie as soon as I get home. I don’t think it has really sunk in for any of us that she is going to be in China for 4 more months. We were just talking about Thanksgiving plans and realized that she would not be home. So strange! I was so excited when I found this song. I LOVE the sound! This song was released by The Shanghai Restoration Project in 2005. Their sound is very exotic. It is contemporary electronic music that combines traditional Chinese instruments and sounds with Western hip-hop and electronica. I absolutely love the video as well because I get the picture of China that my daughter is describing. The Shanghai Restoration Project was started by Emmy-winning Producer, and Chinese-American, Dave Liang. Liang was born in Kansas and grew up in upstate New York. He attended college at Harvard University where he majored in Applied Math and Economics. He has produced an amazing sound that is pretty timeless. They will be touring next year (2015) in China and two locations in the US: Provo, Utah (interestingly) and New York City. Check out their other music, it is really cool I really like Babylon of the Orient and Babylon of the Occident. Missing you my Miss Shanghai!